Some might call it heresy, but I think “Tooth Tunes” qualifies as innovation in the application of music therapy to oral hygene. When pressed to the teeth, the toothbrush emits a recorded riff from a pop star that lasts two minutes — precisely the time dentists say children should spend brushing their teeth. The recording is on a microchip. Push a button on the toothbrush, and a minicomputer starts playing the song. 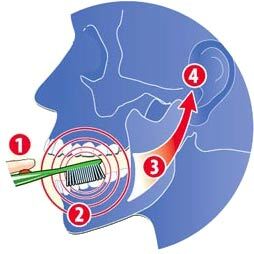 Sound waves are transported through the transducer to the front teeth, traveling from there to the jawbone and then to the inner ear. Brand Autopsy has more here. This entry was posted on Friday, February 23rd, 2007 at 8:31 AM	and is filed under Art, Music, Dance. You can follow any responses to this entry through the RSS 2.0 feed. You can leave a response, or trackback from your own site.